Our “communication effectiveness for leaders” theme continues by addressing the challenge of unproductive email communication. We all initiate and receive email messages. We all respond to email messages. We all get email messages that are irrelevant to us. We all see email messages that are long, detailed, and poorly written. 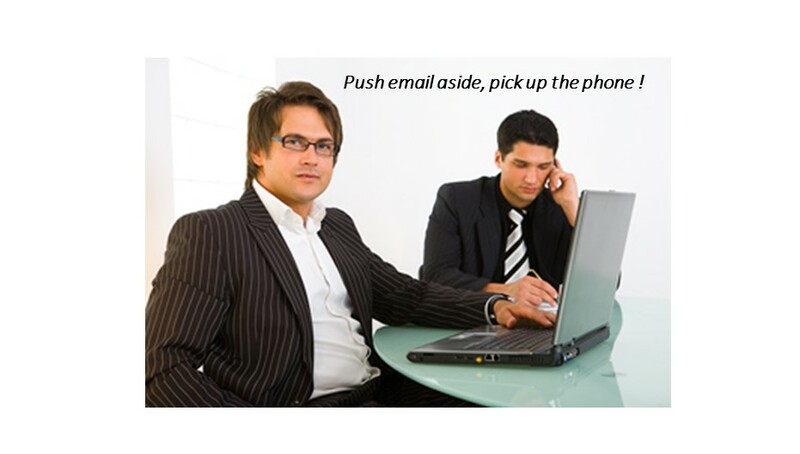 Eliminate unproductive email conversations by picking up the phone. Encourage your team to do the same. 1. Ensure clarity of communication – You listen carefully to others’ words and intonations and articulate your response accordingly. 2. Save time – You come to a speedy resolution of issues and avoid increasing them in complexity every time someone responds. 3. Reduce frustration – You can achieve closure in a conversation, which reduces frustration and often generates satisfaction. 4. Allow trust and transparency to be present – You don’t let these qualities be misunderstood or hidden in lengthy text. 5. Maintain relationship connections – Because email messages can be easily misinterpreted, you’ll create connection instead of causing hard feelings and even resentment. Minimize your communication challenges by rethinking how you receive and deliver email messages. What changes can you make? Start with pushing aside your email. Just pick up the phone!